Brown coconut coir is a natural fiber made from the husk of ripe coconuts. This fiber is commonly used in a variety of products, like floor mats and brushes. One of the most popular products, however, are coconut fiber liners, which are commonly found and used in hanging baskets and planters. 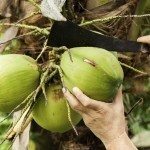 There are several reasons for using coconut fiber liners. They can hold a great deal of water, releasing it slowly to allow plant roots to better take it up. These water saving coconut liners also provide good drainage. They’re porous too, allowing for good aeration. These liners are very absorbent, so if hanging baskets or planters should become too dry, they will quickly re-absorb water. In addition, the organic material of coconut coir contains a neutral pH (6.0-6.7) and small amounts of beneficial phosphorus and potassium. Many coconut basket liners contain antifungal properties as well, which can help discourage disease. There are many types of coconut planter liners to choose from. They come in various shapes and sizes to meet just about anyone’s needs. These water-saving coconut liners are perfect for use indoors and out and are normally placed within planting troughs, window boxes, hanging baskets, and other types of planters/containers. You can choose a liner shaped to fit your planter or hanging basket or use the preformed coconut coir that can be placed over top of the container and then pressed down inside, conforming to the shape of the container. Once placed inside the planter, you can moisten the liner and add potting soil or other planting medium. You may also want to consider adding in some water absorbing crystals or perlite to the potting mix as well to retain additional moisture. In times of excessive heat and windy conditions, especially with hanging baskets, this additional moisture is necessary to keep plants from drying out. Although coconut fiber liners hold and absorb water well, they are still porous and apt to dry out more quickly. Therefore, you should always check plants frequently to stay on top of their watering needs.